Sometimes at the first usage, KDE gives not sharp font rendering by default configuration. For example, you may see two pictures below. 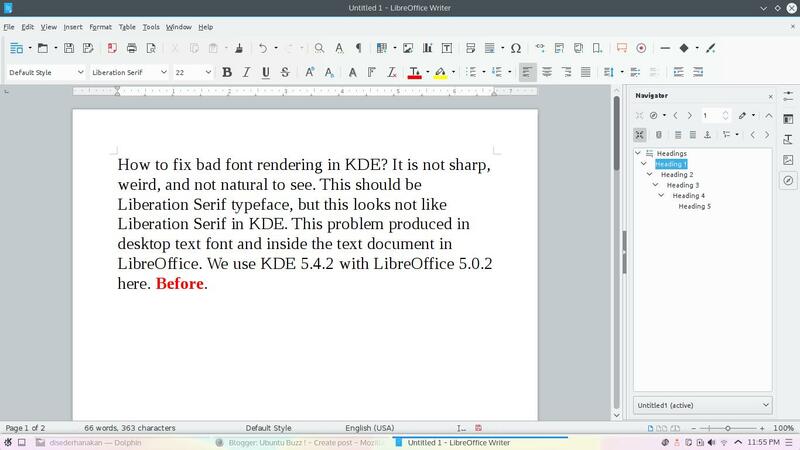 This is probably pretty annoying for LibreOffice users in case we need to see text (and font) a lot. Actually, KDE System Settings provides us the fix. We have tried this in KDE 4.10.3 and KDE 5.4.2. We used LibreOffice 3.5, 4.4, and 5.0. This works in all our systems. This should works too in your systems using any version of KDE. Open KDE System Settings > Fonts > set Use anti-aliasing: field into Enabled > click Configure > dialog Configure Anti-Alias appears > set Sub-pixel rendering type: field into RGB > set Hinting style: field into Slight > press OK > press Apply > restart your programs (LibreOffice etc.). Before the settings, LibreOffice interface looks like this. 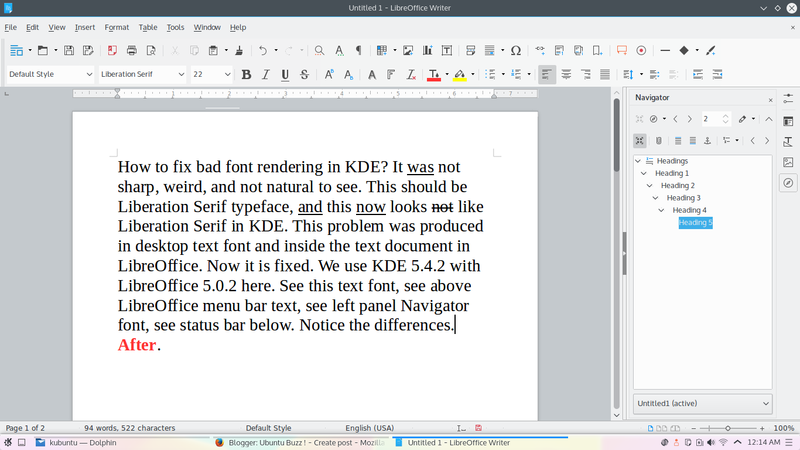 This happens in KDE 5.4.2 LibreOffice 5.0. Notice the menu bar text, toolbar standard text, document text, left panel Navigator text, and the status bar text. They are not natural to see. In other word, ugly. Now see all positions mentioned above. Compare the text. This one is far better.